A Gold Sovereign is a gold coin first issued in 1489 for Henry VII of England and still in production as of 2008. The gold content was fixed at the present 113 grains (7.322 g). 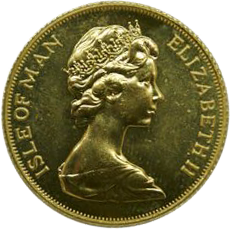 The Isle of Man Sovereign is one of the most collectable of all the modern version of the historic Sovereign coin. The Sovereign is itself one of the oldest coins that are still in circulation to this day, dating back to the reign of Henry VII in the 15th century. While its circulation did not remain constant, it is still thought to be of the very most collectable, and therefore valuable, coins in the world. 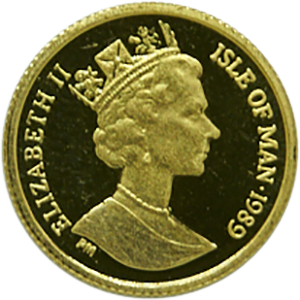 The Isle of Man Sovereign is a limited-edition release that is produced by the world renowned Pobjoy Mint, which has produced coins for governments around the world, including those in Europe, Africa and Asia. With unique series sovereigns, such as the iconic cat series with its Manx and Persian designs, it has managed to carve out a niche in the market that makes it one of the most reliable investments in gold bullion. It has a purity of 916.7, or 22 carats, meaning the coin’s gold content alone is of high value. It weighs 7.98g and weight of gold alone is 0.2354oz (7.322g). It measures 22.05cm in diameter and is 1.52mm thick. It’s face value is a nominal £1, but the coin’s gold content alone makes it many times more valuable. Gold bullion from government mints are among the most reliable investments in precious metals in the world, but it is still important to purchase products from a well-respected vendor. Goldinvestments.co.uk is one of the most experienced online traders in precious metals in the country. All out products are stamped and verified by the appropriate authorities and described accurately. We also provide a London based office, from which we are happy to dispense expert advice on all matters related to gold trading, collecting and storage.